Tea has always been my go-to beverage when I’m feeling under the weather. Testing out OLBAS Instant Herbal Tea has only reinforced that opinion. Created by Hänseler AG in Switzerland and distributed by Penn Herb Co., OLBAS is marketed as a “Deliciously soothing” tea that “promotes respiratory health” (with a disclaimer that the health benefits have not been evaluated by the Food and Drug Administration). Looking at the ingredients, I can understand why they make that claim. The 20-herb blend includes peppermint, chamomile, fennel, thyme, Iceland moss, licorice root, lemon balm, star anise, marigold, yarrow root, elder flowers, lime flowers, blackberry leaves, sage, eucalyptus leaves, plantain leaves, cyani flowers, cowslip, mullein flowers and malva flowers. That’s a lot going on in one tea. I admit, when I first opened the container, I was a little put off by the look of the tea. I was expecting leaves and got… hamster food. The ingredients were processed into tiny light-brown pellets, presumably to make it easier to dissolve, which it does quite quickly. 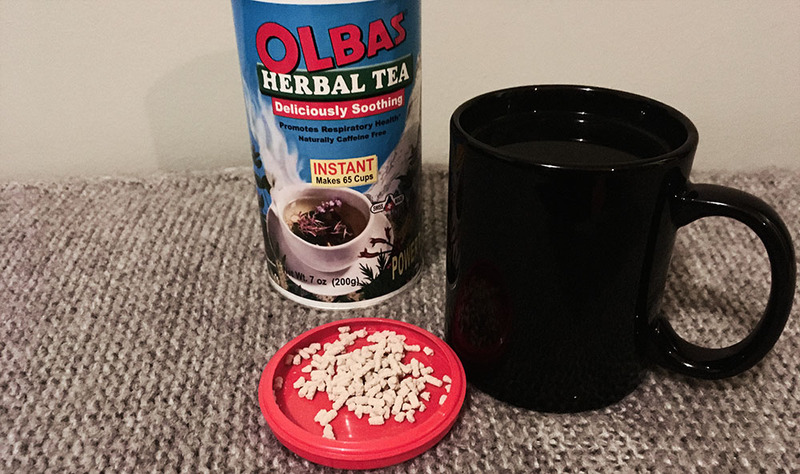 OLBAS instant tea works in much the same way as instant coffee – you put the tea into a mug of hot water and stir until it’s dissolved. A simple, quick way to have tea without having to clean up an infuser or toss out a leaf-filled bag. The aroma wafting out of the container reminds me of one of my grandmother’s peppermints (those big Wilhelmina peppermints) – minty and a little bit musty. There are also spice and woody notes. Once the pellets are dissolved in water, that musty smell is replaced by floral notes and the peppermint aroma is softened into something more… dare I say… soothing. It’s quite pleasant. When you first sip, it’s like putting a peppermint in your mouth. Mint dominates the other flavours and lingers long after you’re done sipping; feels a bit like eating a cough drop. The other herbs and ingredients do soften that minty taste after a while, but for the most part, it’s a mint tea. Overall, a decent tea. Whether or not it has any health benefits remains to be seen, but I will enjoy a mug or two when I feel a cold coming on.